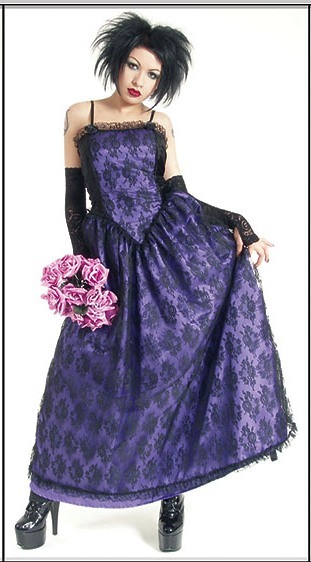 Eternal Love Gothic Violet Taffeta Lace Party Dress [5145V/R] - $45.59 : Mystic Crypt, the most unique, hard to find items at ghoulishly great prices! Eternal Love Gothic Violet Taffeta Lace Party Dress Play that Moulin-Rouge femme-fatale in our boned party-dress !! Polyester black lace lined with gem-colored acetate taffeta, trimmed with lots of shirred black lace & rosettes. Adjustable shoulder bra-straps. Material is very stretchy. Beautiful Gothic ball gown, floor length. Very feminine. Black lace overlay with Violet Fabric Underneath. This dress has a tie dye effect and is darker purple towards the top, and goes to a slightly lighter pinkish purple on the bottom. *This item has been discontinued, this is the last remaining stock available! * Please read measurements carefully!